After 2 torn ACL injuries, 2 sprained MCL injuries, a stress fracture and 4 knee surgeries, Dre Brown, wearing number 27, was able to make his debut in a game for Illinois. Coming out of high school, Brown was ranked as a three-star recruit and the No. 37 running back in the nation in 2014. He committed to Illinois in March of 2014 and was expected to be a big part of the rebuilding with the Illini. But then, the injuries happened. A torn ACL in the spring of 2015 and another one in the spring of 2016, forced Brown to do some soul searching and really think long and hard about where his identity was found. 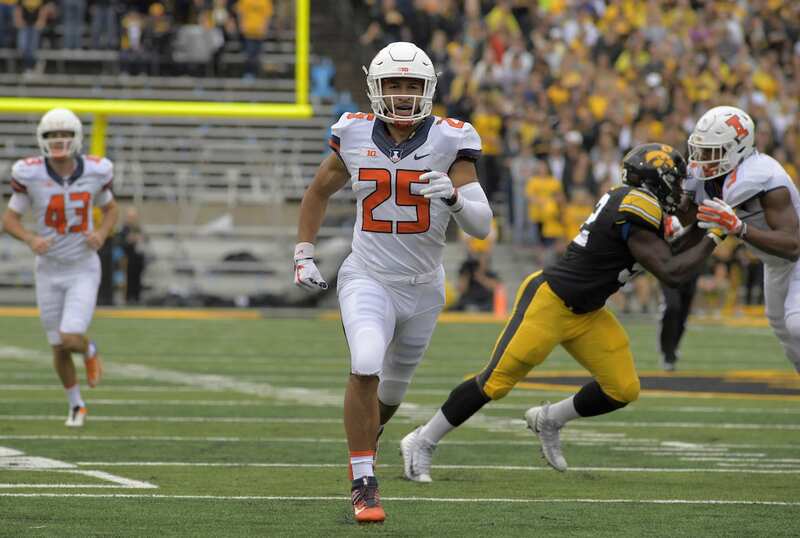 In 2017, many thought they would never see Brown on the field as a member of the Illini, but with faith in God, and a lot of hard work, Dre Brown made his debut this past Saturday against Iowa. In an exclusive interview with Sports Spectrum, Dre shared how he put his faith and trust in God and started walking with the Lord during that rough stretch of injures in 2015. Dre’s also celebrating another accomplishment —- engagement. On July 24, he proposed to his girlfriend Lindsay and the two are now set to marry in 2018. Click below to listen to the entire interview with Dre Brown and Sports Spectrum’s Jason Romano.